August is almost behind us. College Football goes into full swing this weekend. Soon all my whining about the steamy weather will be a distant memory. I often worked shirtless during the spring and summer months. Hanging 30 feet off the ground, no one noticed. When we finally when home that autumn, I was as brown as an old brogan. There was not one ounce of fat on my bones. As I got older and my job moved inside, I became acclimated to air conditioning. These days I have to limit my time in the heat. I said all that to get to this: I will not miss the hot weather. Autumn here is the festival season. Jilda and I played a music festival a few years ago in Tennessee. One of the stages was under the portico of an old barn. Portico is a fancy word for the place where the farmer once parked their tractor. 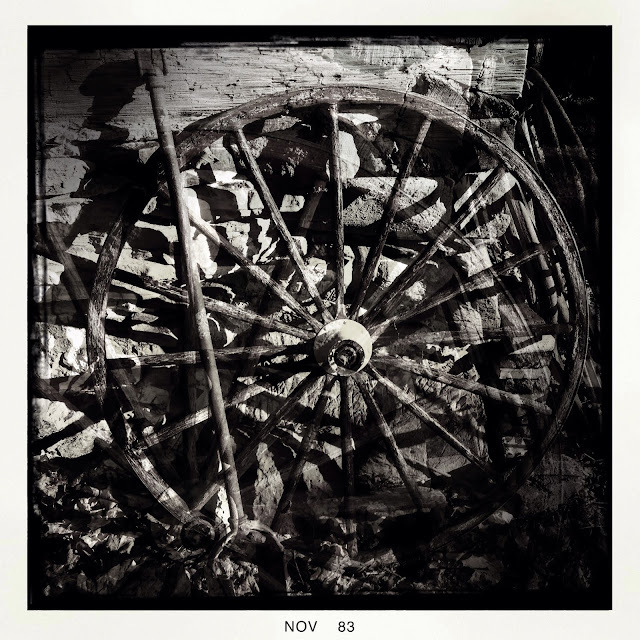 Outside leaning against the barn was a wagon wheel that I'm sure was older than me. I thought it made an interesting picture. As I looked through my older photographs, I came across the wagon wheel and it reminded me of autumn. I have never dealt well with the heat. Except for about a month of un-godly heat this has not been too bad a summer. Heat exacerbates my MS. In the sweaty season I hunker down inside and try and avoid coming outside between dawn and dusk. I adore the arboreal fireworks which autumn brings though. It's been extremely warm here in Portland, around a hundred degrees. I love the bright light that's perfect for painting, but I'm not a fan of the heat. I love the heat. But I love the smell and feel of fall. Winter NO. I wish I were thinking of autumn, but it will stay very hot here during September and most, if not all, of October. If it gets down to sixty degrees, then I'll consider the possibility of autumn, but it usually doesn't get here until December or January, when the rest of the U.S. thinks it's winter. My son works in the heat all day. He's a tough guy. I don't care for very hot or humid weather or extreme temperatures. I love september weather. I only use air conditioning in the car. Stay safe form extreme weather. I miss the colors and air of autumn. Here we don't feel the chill and change. Sigh. I miss that. Love the photo. So many memories must be wrapped up in it. We're supposed to "cool down" tomorrow to 108. I used to enjoy winter when I was younger, but as I've got older I prefer our summer, but of course when the temps. get to 40C I am not real happy. Thank Goodnes we have air con. in the car and house. Herre in Adelaide we're still getting very cold temperatures overnight but the days are a bit better at around 20C today and hopefully will get warmer in the next few weeks.